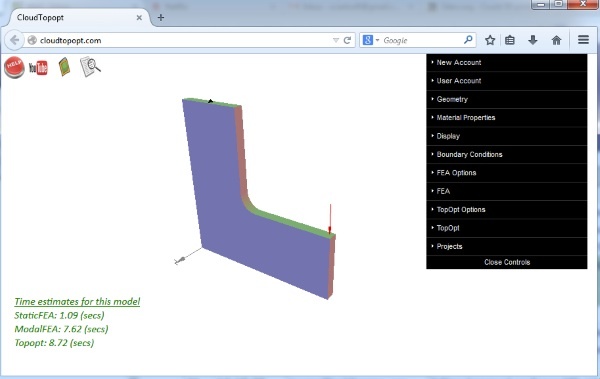 3D Design Tips – Cloud Topology Optimization: Optimize your STL designs for 3D printing using browser-based software #3DThursday #3DPrinting « Adafruit Industries – Makers, hackers, artists, designers and engineers! …Prof. Krishnan Suresh’s team at the University of Wisconsin has now shared a very useful piece of software that will significantly reduce printing time and expenses: Cloud Topology Optimization. This handy program will allow you to easily optimize the size and shape of your STL files without sacrificing durability or functionality. Their method relies on high performance finite element analysis and cutting-edge topology optimization to remove unnecessary material prior to printing. As the figures illustrate, you can simply upload the STL file of your choice and adjust its settings, after which the software will easily and quickly (visually) modify your design to its optimal shape. Additional constraints such as symmetry can also be imposed to guide the software towards a preferred design. The final design, often computed in less than a minute, can be saved in a standard STL format for 3D printing. This will not only save you hours in printing time, but also in design. For a complete tutorial on the software’s functions and abilities, check out this YouTube-based tutorial. Until now, Cloud Topology Optimization was only available for desktops, either as a standalone, or embedded within SolidWorks. But it can also be accessed from the comfort of a browser at www.cloudtopopt.com. The software is supported on most browsers including Firefox, Chrome and Opera, Internet Explorer (partial support) and Safari (with WebGL enabled)….